Since 2003 we have been doing river and road clean ups. 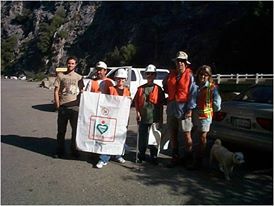 As volunteers with the National Park Service and the U.S. Forest Service, we are now hosting at least 3 clean ups each year on the Saturday’s following the major holiday weekends: Memorial Day, July 4th, and Labor Day. We are looking into the Adopt A Highway Program with CalTrans for the reach from Boyden Cavern to the National Park Boundary where Highway 180 officially ends.